The summer may be coming to an end, but that doesn’t mean you need to give up on your travel plans for the year. With fall comes fewer crowds and better prices if you plan on travelling. But where should you go? I’ve picked out some of the best destinations to head to this autumn. With fewer crowds and the temperatures being a bit more bearable, it doesn’t matter where you go to in Florida. Orlando is ideal in September and October when the kids are back in school, and the lines for rides are shorter. November is the start of the dry season so head to Miami where you can lay on the beach or head a bit north to Ft. Lauderdale where you can take a river cruise. If you’re itching for a road trip, there’s the Florida Keys, but it’s also worth exploring Naples, Fort Myers, and Sarasota on the Gulf side. Regardless of where you end up, know that hotel prices will likely be lower. Canada has already turned 150, but that doesn’t mean you should stop exploring our beautiful country. For a real Canadian experience, head to Churchill, Man. where polar bears come out to play. Okay, I don’t advise that you actually play with them, but it’s jaw dropping to see them wander through town. Don’t worry there are guided tours in tundra buggies where you and the bears will be safe from each other. If you’re lucky, timing will work out where you can catch the northern lights at the same time. One of the times they’re most visible is from late August to early September. Note that if you do plan on visiting Churchill at this time, you should be looking to make your bookings now. September tends to see the fewest visitors in Dublin which makes it the perfect time to visit. Stroll down the River Liffey and just enjoy the city and its people. Dublin is full of culture with its museums, castle, and churches. One attraction that shouldn’t be missed is the Book of Kells, a famed medieval manuscript, which can be found in Trinity College’s beautiful library. September is also when the Dublin Fringe Festival takes place so you can catch some of the best performances the world has to offer. Of course, if you’re going to Ireland in the fall, you should take some time to explore the rest of the country. Some things you shouldn’t miss include the Wild Atlantic Way, the Cliffs of Moher, and Donegal. Most people try to visit Japan in April when it’s cherry blossom season but come in the fall for an explosion of autumn colours. Since Tokyo is a concrete jungle, you’ll have to head to the parks to see the foliage, but once you get out of the city, you’ll be blown away. The Fuji Five Lakes region is one of the best spots to view the fall colours, plus you can enjoy a dip in one of the many hot springs. Kyoto is also a great place since you can pretty much walk in any direction and find temples and trees to marvel at. Of particular note is the area of Arashiyama in Kyoto. During the fall, the famous bamboo forest plays second fiddle to the crimson maple trees found in the valley. Want to know the best thing about Japan? It’s surprisingly affordable. There’s no bad time to visit San Francisco, but the fall is when hotel prices drop a touch which is great considering how expensive this city can be. 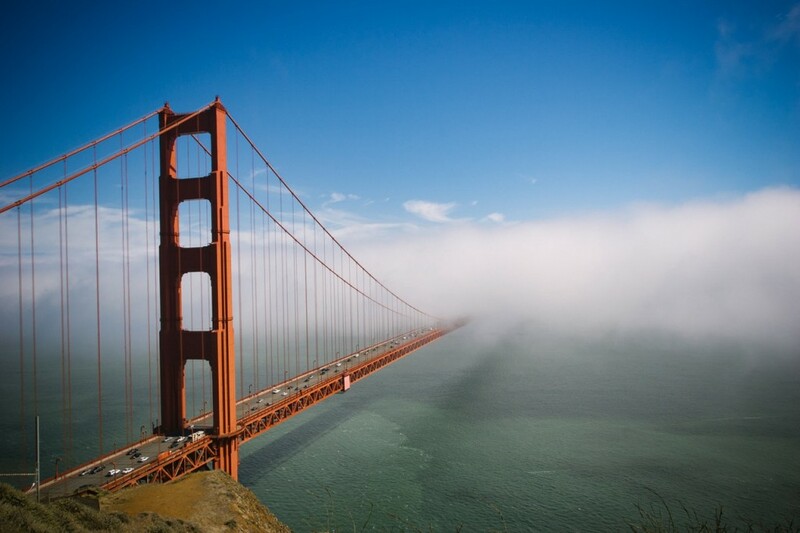 There also tends to be less fog at this time of the year so you can grab that perfect picture of the Golden Gate Bridge. The major sites will naturally be on your radar, but it’s worth exploring a neighbourhood like The Mission where art and food meet. If you plan on making a road trip down the Pacific Coast Highway, San Francisco is the perfect place to start since you’ll be right beside the ocean the entire time. There are a couple of reasons to visit Hong Kong in the fall. The Mid-Autumn Festival and the National Day of the People’s Republic of China both take place in early October and spark celebrations across the city. Since typhoon season has wrapped up, now’s the perfect time to hike one of the many trails that Hong Kong has to offer. If you’re a foodie, you won’t be disappointed. Hong Kong’s street food is some of the best in the world! You can have dim sum at Tim Ho Wan, the cheapest Michelin-starred restaurant in the world or have some street food at one of the markets. Most people know to make a trip up the peak, but it’s also worth taking in the views from the upper deck of one of the trams that go across Hong Kong Island. Costa Rica is another destination that’s great to visit year-round, but in November there’s a really unique opportunity to help the community. You see, this is when leatherback turtles nest, so you can sign up for a volunteer program to help protect them. Alternatively, you can join a guided tour to see the turtles. Now if you prefer to see the natural sites of Costa Rica, head to Rincón de la Vieja Volcano National Park for stunning landscapes or Samara Beach for some downtime away from the crowds. Did you know that Oktoberfest actually runs from mid-September until the first Sunday in October? Most visitors tend to time things for the end of this two-week festival, but it’s better to arrive earlier when things are just getting warmed up. Grab a pint —or litre —of beer and join the crowds in the tent city that’s set up just for this event. Even if beer isn’t your thing, there’s no denying the happy atmosphere at this time. As for sites, the city is packed with museums and churches, but you’ll want to try and make a day trip out to Neuschwanstein Castle which inspired Walt Disney to create the Magic Kingdom.